Kristen Hietala, a senior majoring in chemical engineering, has always been interested in the natural environment around her. So, working on renewable energy research as an undergraduate at Mines just made sense, she said. Hietala will be traveling to Washington, D.C., later this month to present her research to members of Congress and their staff members during the 23rd annual Posters on the Hill event. She was one of 60 presenters nationwide chosen to participate in the prestigious two-day event, sponsored by the Council on Undergraduate Research. Hietala’s research, under the direction of Chemical and Biological Engineering Professor Colin Wolden, is focused on the scaling up of a “green” chemistry technique for producing lithium sulfide nanocrystals, an important component for next-generation solid-state batteries. Hietala has been working in Wolden’s lab since the summer after her freshman year. 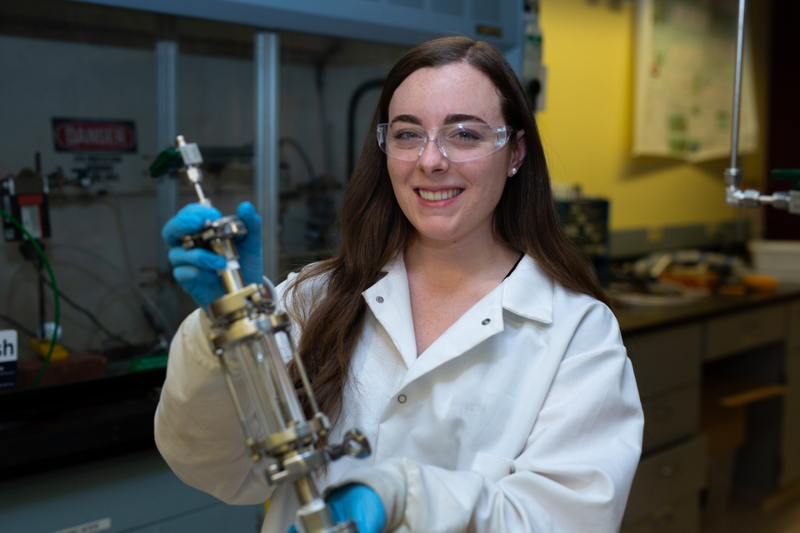 Last summer, a paper she lead-authored, "Scalable Synthesis of Alkali Sulfide Nanocrystals Using a Bubble Column Reactor,” was published in the journal Industrial & Engineering Chemistry Research. “While many undergraduates in my lab have been co-authors on papers, Kristen is the only one to first-author an archival journal publication,” Wolden said. Wolden said Hietala’s work developing bubble columns as a platform for scalable synthesis of the nanocrystals was also instrumental in efforts to secure a $380,000 grant from the National Science Foundation to expand Mines’ research on the topic. It will be a busy couple of weeks for Hietala, between Posters on the Hill at the end of April and graduation May 10. She’s already accepted a job in Kansas City as a consulting analyst in Accenture’s consulting development program.